Sewage Treatment Plant Installation Arrington, Cambridgeshire. Located on the delightful Wimpole Estate in South Cambridgeshire is Rectory Bungalow. After the renovation of the property in 2012, Mantair were appointed by the National Trust as the preferred contractor to provide a design, installation and commissioning service for the upgrading of an ageing septic tank serving the property. On viewing the drainage layout of the property it was found that the existing septic tank was located close to a willow tree. 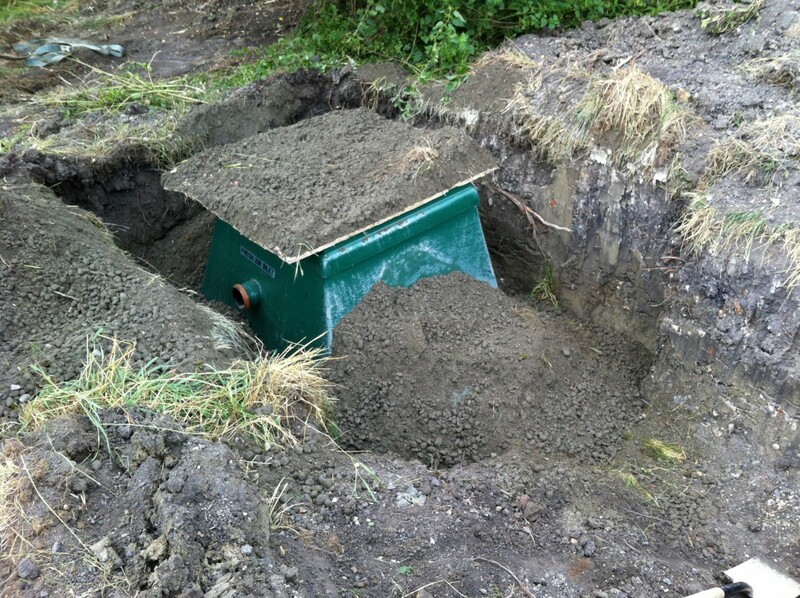 On inspection of the septic tank it was found that the tank had substantial root ingress which had resulted in the structural integrity of the tank being impaired. It was therefore necessary to provide a sewage treatment solution that would require the installation of a new tank. A detailed survey was carried which included a Percolation Test. The results of the Percolation Test showed that the sub-strata was impermeable and that a replacement septic tank soakaway system would not operate effectively. After considering all the various options for foul drainage disposal and the size of the property, Mantair recommended the installation of six person sewage treatment plant with a discharge direct to a nearby watercourse. It was important that the chosen sewage treatment sewage treatment plant was installed below ground to ensure there was no visual impact on the properties surroundings. As part of the project Mantair liaised with the Environment Agency and the local Building Control Department to obtain the relevant approvals for the installation and the discharge to the nearby watercourse. Prior to any ancillary works commencing Mantair engineers scanned the proposed location of the new sewage treatment plant and areas where any excavations were taking place to ensure that no underground services were present. On completion of the ancillary works Mantair commissioned the new sewage treatment plant, including setting of air valves, checking all pipe work joints and viewing the discharge into the final discharge chamber. If you require assistance with a septic tank problem in Cambridgeshire or have a requirement for a new sewage treatment plant or septic tank, call our team today to receive a free site visit on 01255 853890.